Don Álvaro de Figueroa y Torres-Sotomayor, 1st Count of Romanones, Grandee of Spain (Madrid, 9 August 1863 – 11 October 1950, Madrid) was a Spanish politician. He was the Prime Minister of Spain three times between 1912 and 1918, president of the Senate and seventeen times minister. He belonged to the Liberal Party of Sagasta and Canalejas. He was the second son of Ignacio de Figueroa Mendieta and Ana de Torres Romo, marquises of Villamejor, rich owners of land and mines. He graduated in law from the Central University of Madrid in 1884 and obtained a doctorate from the University of Bologna. He e never practiced law and was always involved in politics and business. He started his political career with the support of his father in law, an influential politician, and he represented for Guadalajara from 1886 to 1936. 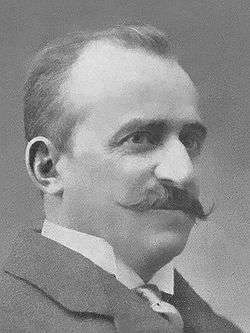 He was elected councilmember to Madrid City Hall and, in 1894, mayor of Madrid. His political career was always linked to the Liberal Party of Práxedes Mateo Sagasta. He was Minister of Public Instruction and the Arts (1901-1902) in the government of Sagasta during which he incorporated teachers' salaries in the nation's budget. In 1903 he founded a political newspaper, Diario Universal. In the Liberal governments of 1905 and 1906 he was Minister of Development (Fomento which included agriculture, industry, commerce and public works), Justice and Interior. He contributed to the rise of José Canalejas to the top of the Liberal Party and, as a reward, he was appointed minister of public instruction in 1909 and later propmoted to the presidency of the House of Representatives (Congreso de los Diputados) in 1912. After the assassination of Canalejas, he became one of the prominent figures in the Liberal Party and he was appointed prime minister (1912-1913). He negotiated with France a treaty on Morocco. During the First World War he held a pro-French stance, which put him in conflict with the official declaration of neutrality of the government of Eduardo Dato and with the pro-German stance of the conservatives. When he again became prime minister (1915-1917), he changed Spain's foreign policy closer to the allies and confronting Germany over an incident of Spanish ships being torpedoed by German submarines Incapable of resolving Spain's social problems and attacked by the pro-German conservative press, he finally resigned. Shortly after he participated in the coalition government of Antonio Maura as Minister of Instruction and of Justice and in the government of Manuel García Prieto as Minister of State (1918), and he presided a brief government in December 1918, which was toppled by the autonomist agitation in Catalonia and the labour conflicts. He was replaced in April 1919 after issuing the Eight Hour Workday Decree. He was minister of justice (1922-1928) in the liberal government of Manuel García Prieto and became president of the Senate in 1923, after the military coup of Miguel Primo de Rivera on 13 September 1923. During the dictatorship, he stayed out of politics although he participated in the conspiracy known as the Sanjuanada for which he was fined. After the fall of the dictatorship in 1930, he became Minister of State in the government of Juan Bautista Aznar Cabañas, but the elections in 1931 showed that the monarchy was unpopular so he advised King Alfonso XIII to leave Spain. Romanones talked personally to Niceto Alcalá Zamora and his revolutionary committee and agreed to the peaceful transfer of power to the Provisional Republican Government, without military intervention, in exchange of the guarantee for the life of the royal family. During the Second Republic, he remained deputy representative for Guadalajara, but his political weight was insignificant except to defend the honour of the departed king and his own legacy. He did not participate in the military revolt of 1936, and the outbreak of the civil war found him in San Sebastián in charge of his own business, and he crossed over to France with the help of the French ambassador. He returned to the Nationalist zone in 1937 but never again participated in politics. After the war he wrote his memoirs and was president of the Real Academis de Bellas Artes de San Fernando and member of the academies of History and Jurisprudence. He married Casilda Alonso-Martínez Martín, daughter of Manuel Alonso Martínez, a lliberal politician, friend of Sagasta and owner of a renowned legal firm in Madrid. They had three sons, one of which was killed in the war in Africa in 1920, and one daughter. His grandson, Carlos Figueroa, competed for Spain at the 1956 Summer Olympics. Romanones was a prolific writer and he wrote his memoirs during the Second Republic. He wrote several biographies as well as political works and essays. Although Catholic, he was against religious intolerance and also against the influence of the clergy for which he often clashed with religious authorities. An example of this happened with the enactment of the Civil Marriage Law of 1905 which stated that those getting married did not have to declare their religion. He reinstated diplomatic relations with the Holy See but he was a fervent supporter of the separation of Church and State. He was a Doctor at Law by the University of Bologna, a member of the Royal Academy of History and of the Royal Academy of Moral and Politica Sciences. Director of the Real Academia de Bellas Artes de San Fernando and a president of the Ateneo Madrileño. He was made Count of Romanones in 1893 and Grandee of Spain in 1911. He suffered an accident at 9, when he was brushed aside by his father for having interrupted him; in doing so his father accidentally pushed him off the carriage, which left him with a noticeable limp for the rest of his life. It was mercilessly exploited by his caricaturists and opponents. For many years, he funded a hospital for crippled children. ↑ "Carlos Figueroa Olympic Results". sports-reference.com. Retrieved 2012-02-14. This article is based on the article in the Spanish Wikipedia. Wikimedia Commons has media related to Alvaro de Figueroa y Torres.